Kidney is one of the most important organ of the body. Because it has many functions without which person cannot survive. Therefore, for a medical student, a complete anatomy i. e structure of kidney and physiology i.e functions of kidney are very important to learn. Here in this post, i am going to explain the complete renal anatomy and physiology in detail. Kidneys are bean shape structure that lie on the posterior abdominal wall on the sides of vertebral column. They are two in number and helps in the formation of urine. Kidneys are Retroperitoneal organs which means they lies behind or outside peritoneum. They lie just below the diaphragm on the posterior abdominal wall. The right kidney is slightly lower then the left kidney which is located at the level of 12th thoracic to 3rd lumber vertebrae. The reason for this lower right kidney is the large right lobe of the liver which displaces the right kidney and thus it is slightly lower then the left one. Another difference between both the kidneys is that the right kidney lies posterior to the right lobe of liver. While the left kidney lies posterior to the spleen. As mentioned in the start, kidney is a been shaped organ. It has a concave surface (a renal hilum) an artery enters kidney which supplies it i.e renal artery and a renal vein and a ureter comes down. And convex surface on the opposite side. Each kidney is surrounded by 3 layers i.e first the kidney is surrounded by a renal capsule which is a fibrous tissue. Then this fibrous capsule is surrounded by perirenal fat which is a an adipose capsule/fascia. The perirenal is still surrounded by another layer called pararenal fat. Kidney is divided into outer cortex and inner medulla. The first and foremost difference is that left kidney is placed on the left side of mid line i.e vertebral column while right kidney on the right side. 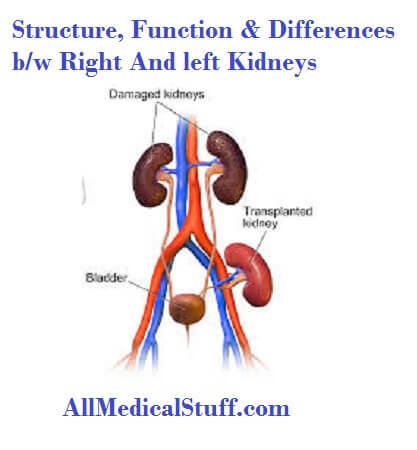 The main difference between both, as mentioned above is that the left kidney is places slightly above then the right kidney. The reason is the large right lobe of the liver that displaces the right kidney. Left kidney is related to 11th end 12th rib. While right kidney is related to 12th rib being lower then the left one. Left kidney is half to 1.5cm longer then the right kidney. Right kidney is related to right lobe of liver while left kidney is related to spleen. Left kidney is related anterior to spleen, supra renal gland, stomach, pancreas, left colic flexure and jejunum. And to 11th and 12th rib, psoas major, , diaphragm, quadratus lumborum, tendon of the transverses abdominis muscle, and transverse process of 1st lumber verterbra posteriorly. While the right kidney is related to right lobe of liver, right supra renal gland, right colic flexure and duodenum anterior. And to 12 rib, diaphragm, quadratus lumborum, psoas major, tendon of the transverses abdominis muscle, and transverse process of 1st lumber vertebrae posteriorly. Kidneys are one of the main source for removal of extra/harmful metabolites from the body which is the main function of kidney. Almost all the waste products such as urea, which is the waste product of protein metabolism, creatinine (from muscle creatine), uric acid, bilirubin products, metabolites of various harmones and drugs etc are eliminated by kidneys through urine which a medium for the excretion of these substances. Controlled excretion of water and electrolytes is very important for homeostasis. Because slight changes in osmolraity can cause server problems like hyperkalamia can cause cardiac arrhythmia and even cardiac arrest. Intake of water and these electrolytes depends on the needs and eating habits of person. But kidneys are responsible for the control of any increased or decreased amount. For example if a person takes too much sodium, various mechanisms in kidneys are activated that causes excretion of sodium and brings back normal plasma osmolarity. Body pH is maintained not only by lungs and buffers but by kidneys as well. They do so by secreting more hydrogen ions or by conserving them. But kidneys are the only organ that get body rid of certain acids produced during metabolism such as sulfuric acid and phosphoric acid. Vitamin D is produced in the skin from the reaction that occurs due to sunlight. It is then coverted to its inactive form in liver that is called 25 dihydroxy vitamin D. It is then converted to active form in kidneys which is 1,25 di hydroxy vitamin D or calcitriol. Kidneys regulate arterial pressure by 2 machanisms. One is long term mechanism and another is short term mechanishm. Short term Kidneys regulation of arterial pressure is by excreting variable amounts of water and sodium. Thus increasing or decreasing blood volume. While it helps in long term regulation by vasoactive substances such as renin which further helps to produce angiotensin 2. One of the very important function of kidneys is the production of erythropoietin. Erythropoietin is a hormone that stimulates hematopoietic stem cells to produce erythrocytes i.e red blood cells. Severe anemia can results due to kidneys failure because of less production of RBC’s as stimulus for its production is not there. Kidneys can produce almost the same amount of glucose as liver during server fasting by the process of gluconeogenesis. How can i keep my kidney healthy, i only have one. Do i have to drink more pints of water than 5 glasses a day? Is it wise to take Vit D suppliments? yes more water is good. the active form of vitamin D is formed in kidney but one kidney can form some vitamin D but taking supplements is good.